Depending on the location of the tree to be felled, Angry Bearver Arboriculture and Tree Surgery Services offer two flavours of tree felling. 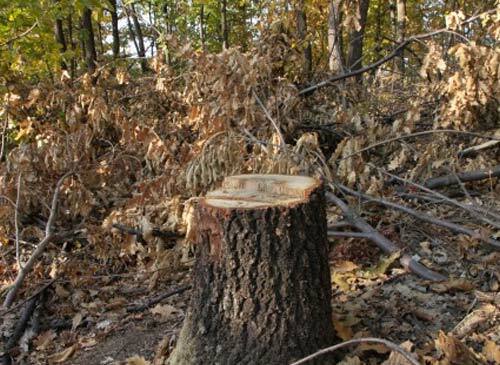 Straight Felling Technique - If the tree has enough space around it, it can be straight felled from the bottom and allowed to fall in a controlled manner. We then cut the tree into pieces on the ground for removal from the site for re-cycling or re-purposing or left in-situ if the customer prefers to keep the wood. Sectional Felling Technique - This method is used when there is limited space. The tree is dismantled piece by piece as safely as possible and each individual section is safely lowered to the ground using specialist rigging equipment. The felled sections are then removed from the site for re-cycling or re-purposing or left in-situ if the customer prefers to keep the wood. Angry Beaver Arboriculture and Tree Surgery Services always check to see if any Tree Preservation Orders (TPOs) are outstanding on any trees before undertaking any tree felling work. If a TPO exists on a tree you wish cut down, then dead wooding or other pruning or reduction techniques may still be allowed. All TPO works will be negotiated with the Local Council Tree Officer on your behalf.